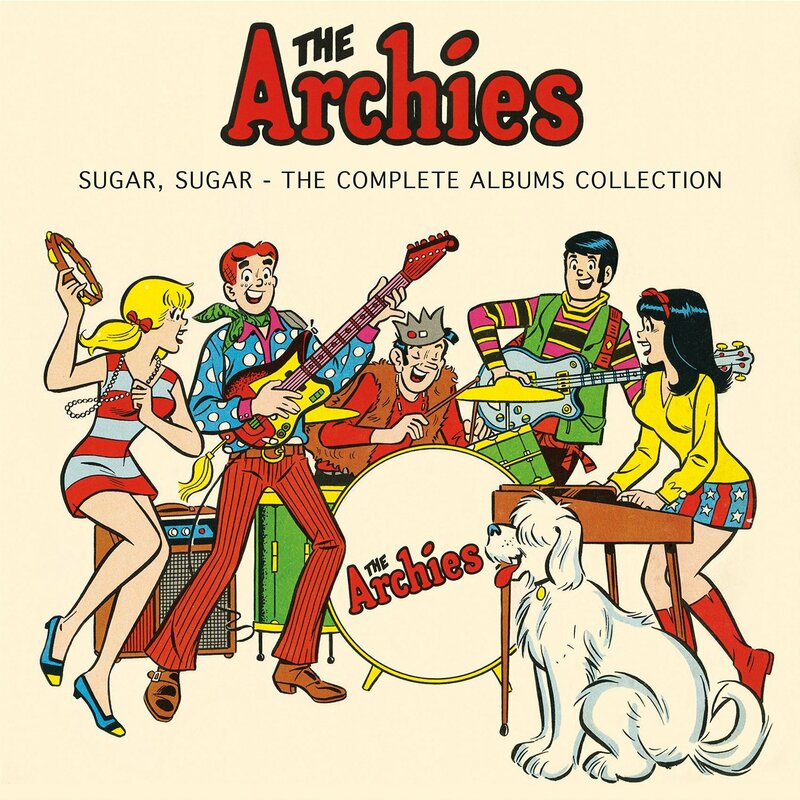 Discussions Magazine Music Blog: THE ARCHIES: Spaz reviews SUGAR SUGAR: THE COMPLETE ALBUMS COLLECTION! THE ARCHIES: Spaz reviews SUGAR SUGAR: THE COMPLETE ALBUMS COLLECTION! Gather ‘round, my friends and let me introduce you to the absolute best cure for your blues: sugar. Well, “Sugar Sugar” to be more precise. Yes, one spin of The Archies’ mega-hit “Sugar Sugar” can wipe away any negative vibe that is inhabiting your universe. Even if you aren’t a fan of ‘60s Bubblegum, you’ve probably heard this gloriously happy tune many times since it was released in 1969. Figuratively (and perhaps literally) the missing link between The Monkees and The Partridge Family, this slice of Pop love has been played millions of times all around the world, used in advertising and has been both praised and ridiculed by music fans everywhere. The fact that you still remember it today – regardless of your personal feelings – is testament to the power that “Sugar Sugar” has had on the listener. The Archies’ animated TV show was based on the popular comic book series that originated in the 1940s. Their clean-cut image may have come from a different era, but in the late ‘60s, that was precisely what the children needed to see. The Vietnam War, drug culture and racial inequality were just some of the subjects that were dealt with on a daily basis on the news, and the world was becoming a scary place for kids. The Archies offered wholesome entertainment that made them laugh and sing along. Under the eyes of music supervisor Don Kirschner, The Archies was destined to be a hit across the board. From toddlers to teens, The Archies’ music had a built-in audience when the cartoon debuted in ’68. For the show’s producers and Kirschner, there were no kooky counter-culture shenanigans like they experienced with The Monkees just a year or two before. In fact, Kirschner had been booted from his position as music supervisor for The Monkees, and was more than happy to take the same position when The Archies’ TV show was conceived – no meddling kids to interfere with his Pop plans. 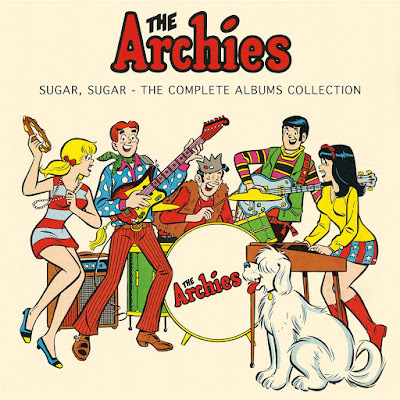 With “Sugar Sugar,” The Archies became the most successful non-existent garage rock band in Pop history that had their own animated series on Saturday mornings. Maybe. I might have to do some fact-checking to back up that claim, but I’m fairly certain it is true. But what about their OTHER songs? You know, the ones not called “Sugar Sugar”? While they may not have seen the same amount of chart success as “Sugar Sugar,” there is plenty to love about their five original studio albums. Yes, five Archies albums! And you thought they only had one song, huh? Here we are, nearly fifty years since “Sugar Sugar” hit the charts and we’re finally getting something more than just a half-heartedly thrown together Archies compilation. In fact, Sugar Sugar: The Complete Albums Collection (Cleopatra) takes The Archies seriously and serves them up in style with five mini-LP reproductions of each of their albums, all housed in a clamshell box with a booklet featuring liner notes, info, pictures and all the fun things you’d want in a box set devoted to these groovy kids. For a Pop music lover like myself, it is fascinating to hear these recordings again while revisiting “Sugar Sugar” within the original context of their oeuvre. Strange to think that that hit was on their SECOND album, Everything’s Archie, but I suppose The Archies certainly avoided the dreaded sophomore slump that so many bands became a victim of over the years. So, how is the rest of the music? Let’s put it this way: make an appointment with your dentist before giving this box set a spin because it is so sugary sweet that you’ll certainly walk away with a few extra cavities! And that, my friends, is a wonderful thing. Take the optimistic vibe of the first two Monkees albums, add in some childlike wonder, squeeze in a dash of the first two Partridge Family albums (if you’re a purist, you can substitute The Cowsills), toss in some real back-to-basics rock ‘n’ roll and then turn it up loud! “Don’t Touch My Guitar,” “Feelin’ So Good (S.K.O.O.B.Y. D.O.O),” “Carousel Man,” “La Dee Doo Down Down,” and so many other songs are nearly as wonderful. You see, the problem people may have with this material is that it will sound dated, cheesy and super gooey sweet…but that pretty much describes “Sugar Sugar” as well! If we had heard these songs hundreds if not thousands of times over the past five decades, they too would be classic Pop nuggets. Maybe. “Hide And Seek” is a heavy garage rocker (well, compared to “Sugar Sugar”). “Justine” is pretty close to classic Baroque Pop. “Together We Two” is a delightful mix of hippie love and Bubblegum Pop. “Comes The Sun” is a late period Archies track that still sounds as sweet as their earlier tracks but also has the same free-spirited charm as the AM Pop that occupied the charts in ’71. I was planning to namecheck at least a dozen more great songs – “Jingle Jangle” was next – but I think you get the idea. Sugar Sugar: The Complete Albums Collection is as delicious as Bubblegum Pop gets and while The Archies may not be considered ‘hip’ and ‘cool,’ they are probably hipper and cooler than anyone you have spinning on your turntable right now! Maybe. A must-have for those who love Pop music and have fond memories of chasing the ice cream truck down their street in order to plop their money down for a delicious treat. This is just as fun with only half the calories! And yes, there is quite a history behind The Archies that I have not touched on here. You can catch up on their history in the booklet included in this box. But I will tell you that "Sugar Sugar" was written by Jeff Barry and Andy Kim. Jeff worked with The Monkees and many others before writing for The Archies. Andy Kim is now best known for his 1974 solo it "Rock Me Gently" (you know, that song that you could have sworn was by Neil Diamond).